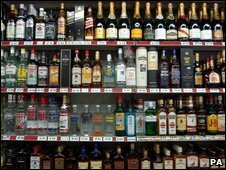 A minimum price for alcohol would have a "considerable" impact if it was set at 60p a unit, a public health expert has said. Dr Emilia Crighton, the convener of the Faculty of Public Health in Scotland, spoke after delegates at its conference voted in favour of minimum pricing. The Scottish government has put forward plans for a minimum price for alcohol to try to tackle heavy drinking. Ministers have yet to fix a price but 40p per unit has been suggested. Dr Crighton insisted there was an "overwhelming case" that cheap drink was damaging Scotland's health. She said: "Research suggests that 866 alcohol-related deaths each year would be prevented by the introduction of a 60p minimum price once the policy is in full effect. "There is an overwhelming case that cheap drink damages Scotland's health record. As prices have dropped, consumption has risen." Health Secretary Nicola Sturgeon welcomed the support for minimum pricing from "those at the sharp end protecting public health". Ms Sturgeon said: "Critics claim minimum pricing would raise the price of all drinks and punish moderate drinkers. But that just doesn't stack up. "Almost all drinks in the pub are already sold well above any likely minimum price, so they wouldn't be affected. And if the level of the minimum price was about 40p per unit, the vast majority of supermarket wines, beers and whiskies would see no change in price. "But the cheap white ciders and low-grade spirits favoured by problem drinkers would rise in price, to a cost that better reflects their high alcohol content. So it's a targeted way of making sure strong drink is sold at a sensible price." The Scottish government plans to use the existing licensing act to introduce the minimum price per unit of alcohol.